Can you find the way to the treasure of your ancestors in the Chief's Fortune slots? Click here to play! The plains are a lonely place if they are not home to your people, and they can be dangerous if you aren't familiar with the predators of the landscape and the many pitfalls that await the unwary. 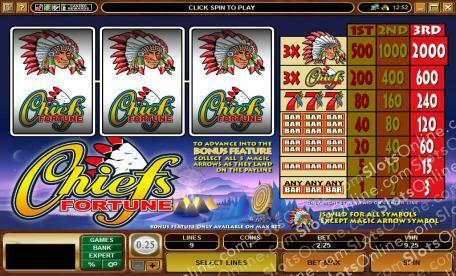 The Chief's Fortune slots are the classic 3-reel type, featuring BAR symbols, 7s, Chief's Fortune Logo symbols and a Chief symbol as the jackpot winner. Players have just one coin value to choose and only a maximum of 3 coins can be wagered at a time. This makes for a basic slots game that is fun to play, with a Native American theme that is sure to appeal to many players. Play the Chief's Fortune slots today, and see if you receive a vision of great riches in the reels. The magic arrows could point the way to your fortune. The Chief symbol is wild and substitutes for any symbol other than the Magic Arrow symbol. The Magic Arrow bonus symbol triggers the bonus round when all 5 of the Magic Arrows are collected on the payline. This only happens when the maximum bet is played. The bonus game has the player click the spin button and then receive items of clothing, each one corresponding to a prize value.